Since I have a ton of soda tabs to play around with, I decided to try out something. Right now I am crocheting around tabs and will probably put them all together and make them into a bag. I’m hoping the tabs will had a bit of firmness to the bag to keep it from being floppy, but I’ll see what happens when I get to that point. I want to try something like this next. I also washed the yarn I spun up and had it hanging to dry in the shower this weekend though it still feels damp to me! I’ll take a better picture when I get it wrapped up. I also have more waiting to be wash on my spindle. Okay, here are the pics. First time trying punch needle embroidery. As you can see, some of it came undone. I think I need to make the loops longer. I’ll have to read about that later. Just the outline so far. This is the yarn I’ve spun so far on my new drop spindle. 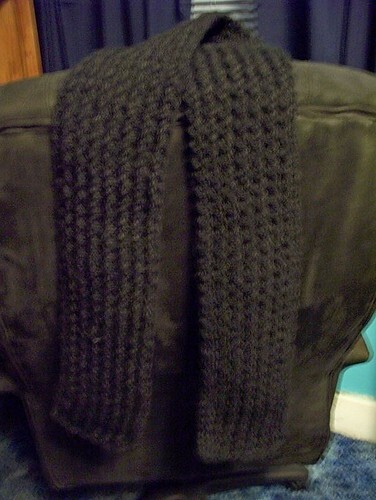 I was having problems with it so the yarn is far from perfect. I got very frustrated so I only did one strip of roving so far.